I last looked in the hive a week ago. It's best not to disturb bees too much if you can help it, especially when they're newly installed. I took it as an encouraging sign that they were a little more spread out than last time (when it was cold, admittedly). It looks like they are following the wedges, from what I can see. Maybe next week I will do a real inspection. I'm a little trepidatious about doing that, partly because I'm worried about freaking out the neighbors, should they see me through the fence. 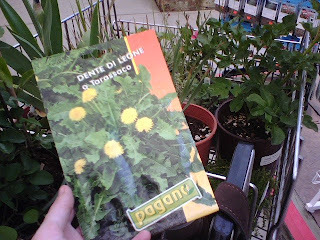 But I did not buy any dandelion seeds. 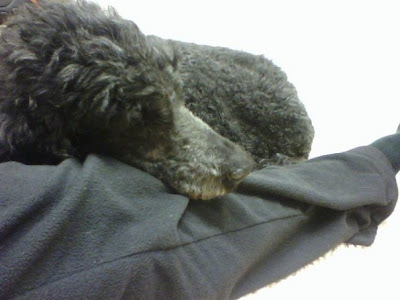 This picture is of Sophie using my leg as a pillow in the kennel at the animal hospital. Came home from work Sunday night to find her coughing this horrible gurgly cough and barely able to stand but also unable to lie down. I thought she was in heart failure and that it was Time. I called my vet and she said she could meet me at the clinic, but I might consider taking Sophie to the emergency vet, that maybe they could do something. So I did, and it turned out not to be heart failure but aspirational pneumonia. She must have thrown up and inhaled some of the vomit. I brought her home today. She perked up immediately, so glad to be back in familiar surroundings. She is on antibiotics for three weeks and hopefully that will get rid of the nasty lung bug. She has now officially Not Dead Yet. It's been just over a week since the bees went in the hive, and I've discovered that a few modifications were necessary. First of all, I opened the observation window to take a peek at their progress and found that I couldn't get it closed again all the way. It was a tight fit to begin with, and I think the wood swelled just enough. So yesterday I took the door off and shaved down the inner edges. And took a photo of the bees while I was at it. They're all clustered up at the end closest to the entrance and (I hope!) building comb. Without opening up the hive top and moving bars around, I can't tell. I don't want to disrupt them any more this week. The other change is putting the bottom board back on. We thought the screened bottom's holes were too small for a bee to get through, but no, a determined bee can wiggle through. 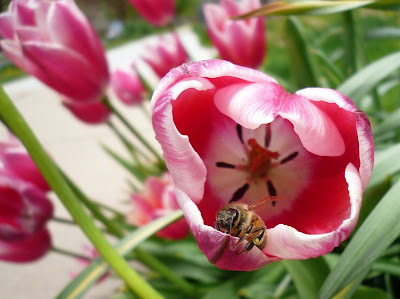 And in doing so, the bee loses her load of pollen! 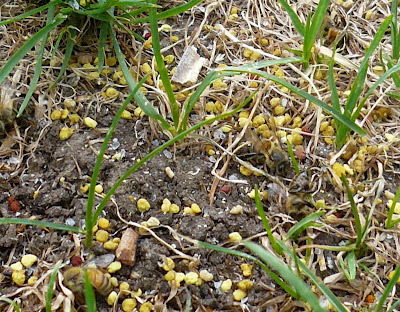 There was a sad little heap of pollen bundles scattered beneath the hive. 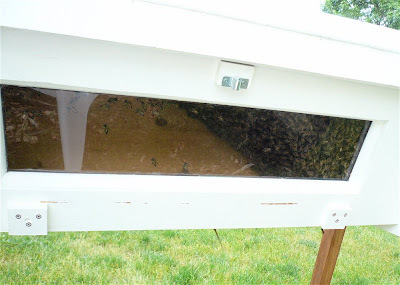 So the bottom board went back on, which was a challenge with all these bees saying, "Wait! No! We need to go through there!" But I did it with just a veil on, no suit or gloves, and nothing bad happened. I picked up that swarm yesterday not knowing who would take it  but I was pretty sure someone would want it. 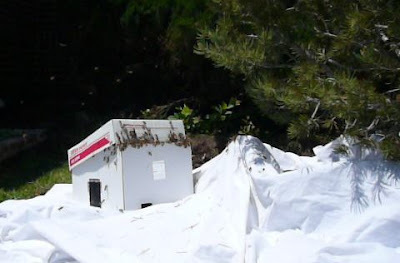 I finally got a call back from S., whose last batch of bees didn't make it. She was delighted to get new ones. Her hive is tucked away next to her garage. Her niece was "helping" but disappeared once the bees started flying. It's instructive for me to watch these videos again, to learn what not to do. In this case, I realized that I really need to shut up with the unsolicited advice. 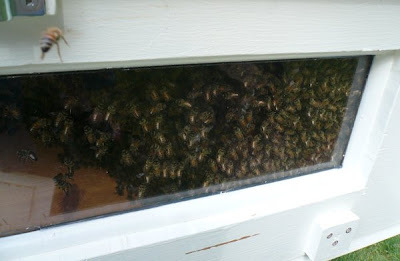 But the bees made it in just fine and by the time I left, the ones outside were steadily making their way in. 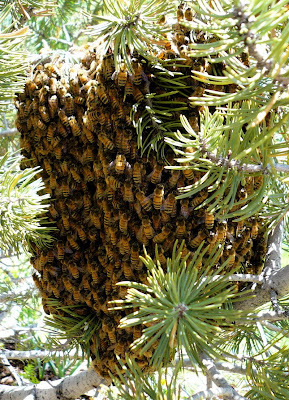 So today I got a call about a swarm right in the neighborhood. Can you spot the bees in this picture? The homeowners got my number from the little garden center where I'd left my Got Bees? cards. 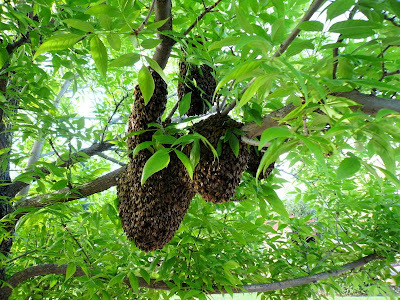 They are avid gardeners and wanted to see the bees go to a good home instead of being sprayed with pesticide by a panicky neighbor. My friend Deb came by to take pictures, so I hope to have some good ones to show you later. Meanwhile, I've got video again. If you watch it, you'll hear a lot of chitchat going on. I had quite the crowd watching. So I put down a sheet under the tree, put the box under the branches, and gave them a good shake. 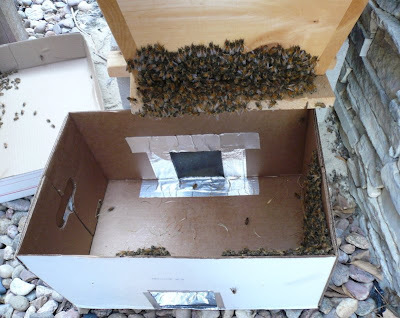 Most of the bees went into the box. After a while, those that were flying realized the queen was in there and made their way into the box, too. I may have left behind a couple dozen, if that. 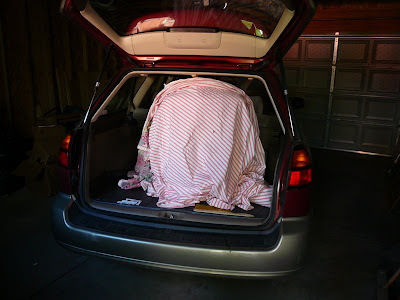 The box came home in my car, wrapped in sheets. Now it's sitting out there unwrappped, with a fan on it. I had to tape up the edges of the lid because bees were escaping that way. I'm just waiting for someone from the swarm list to call me and come get them! Today was the big day. Yesterday afternoon I got a call from Mary of Bee Moving Day fame. One of her hives was swarming. She called me again after dark to say the bees were still there and clumped up in an accessible spot. I got there at 7 this morning. Earlier probably would've been better, as the sun was up and the bees starting to fly a little. But they were pretty compact in a few separate bundles. I spritzed them with a little sugar water, but that just disturbed them. I think that may work better with bees that are "dry," i.e. several days out of the hive and not full of honey. 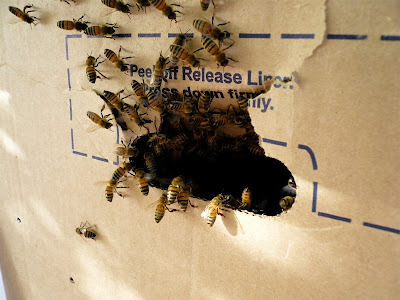 So the plan was to gently lower them into the box using the bee pick. Not a very effective plan, that. I should have just given the branch a good shake, as is the usual practice. You can watch a long, boring and poorly edited video of the process if you've got nothing better to do. In hindsight, I should've just left the box up on the ladder with the lid on and let the bees all go into it on their own. But I wasn't sure I had the queen. So I put the box into a larger one that Mary had. I had a sheet on the ground that I shook into it and then draped over. Then I was sure I had the queen, as there were bees putting their butts in the air and fanning around the entrance. They were signaling to the other bees, "Hey! The queen's in here!" 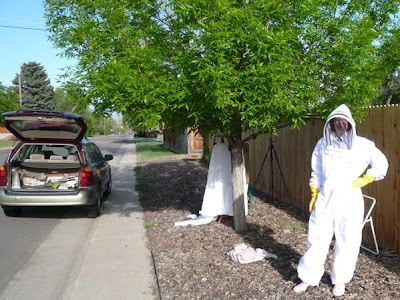 Once I had most of the bees in box, I put another sheet over the whole thing, put it in my car and drove home with the bee suit on. It's a little surprising how many people just go whizzing by in their cars when you're in full bee regalia, though a truck full of public works employees did pause to gawk. I'm sure I got some funny looks from other drivers on the way home, too. 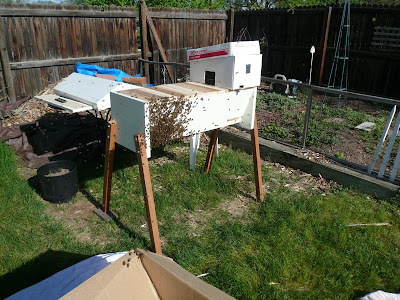 I backed into my garage and carried the box out to the hive. Picked up the interior box and shook it in, and the outer box, too. Oy, what a cloud! I was really worried the queen hadn't made it into the hive. 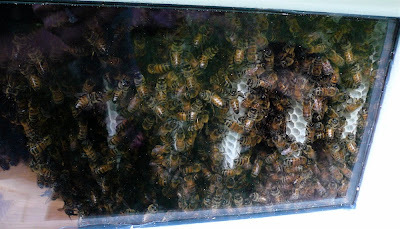 I put the top bars back on and the bees were heavily clumped around the entrance to the hive and underneath, on the screen. But hours later, they were almost all inside the hive, with just a couple dozen hovering in front on orientation flights, learning the look of their new home. Wow, that was a pretty crazy morning! I learned a lot. It was nice to have Mary there offering support. 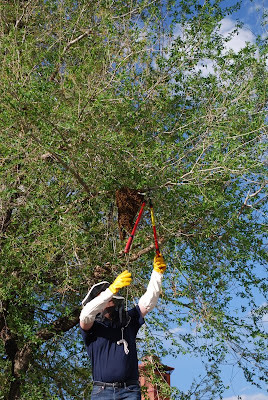 I'm adding sheets to my list of swarm-catching supplies, and also a reminder to remove your rings. Yes, I got stung on my left hand and now I have a slightly fat finger (and yes, I got the ring off). I put on gloves after that. So now it's up to the bees to build out their comb and start filling it with brood, pollen and honey. Go, bees! 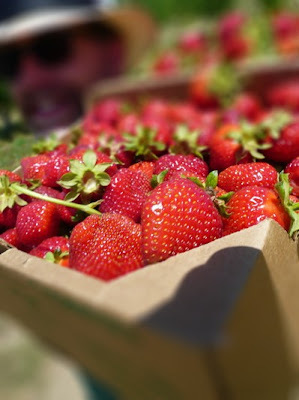 Those fabulous strawberries were picked, I confess, near Winters, California, not in Colorado. Sorry to disappoint! 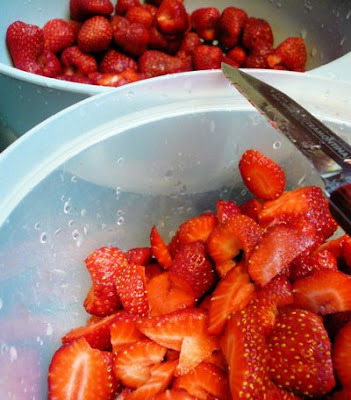 But it gives you something to look forward to, as our own strawberry season is nigh. 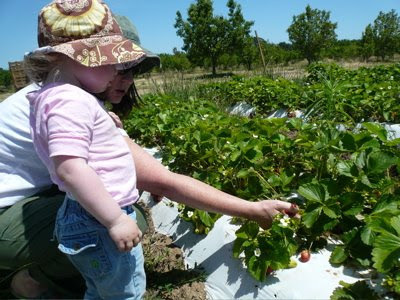 You might find a farm to visit at pickyourown.org. 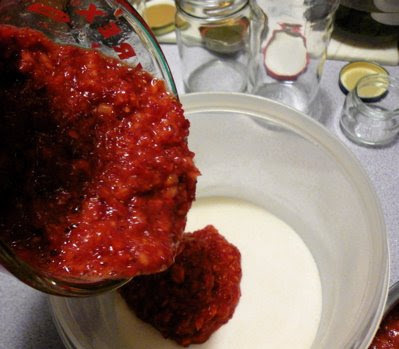 My original intention was to mash the berries coarsely, but lacking a good mashing tool, I resorted to a mini food processor. Four heaping pint baskets will give you roughly the four cups of mashed berries you need to make freezer jam. 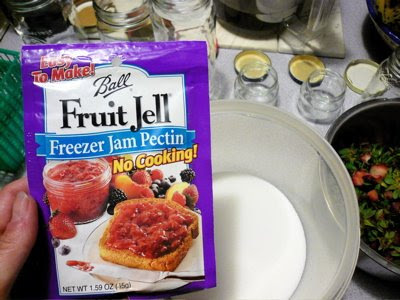 The recipe is on the back of the packet of freezer-jam pectin. You mix the packet with 1 1/2 cups of sugar, add the berries and stir for three minutes. 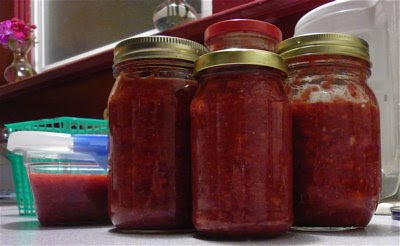 Put the jam in containers, leaving some room for expansion, and let it set up for half an hour or so. 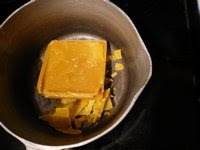 Then keep it in the fridge for three weeks or in the freezer for up to a year. It's exceedingly tasty! With berries this sweet, I could have cut the sugar to a cup. The mixture didn't seem to jell a whole lot, but that's not really a problem. The problem is not grabbing a spoon and eating the entire container at once. It's good with ice cream or shortcake, too. Natch. What could be nicer than a beautiful sunny day and a drive in the country? 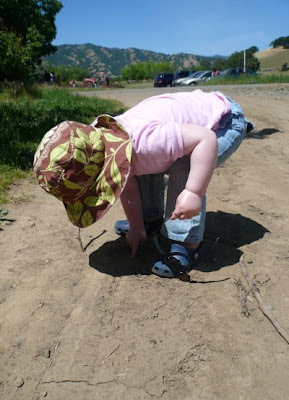 Could it be the opportunity to carefully examine dirt? Pick up interesting sticks and point out bugs? Well, yes, there is that. The Sergeant and I went picking with friends E. and J. We ate our share of sun-ripened sweetness, and filled up a flat. 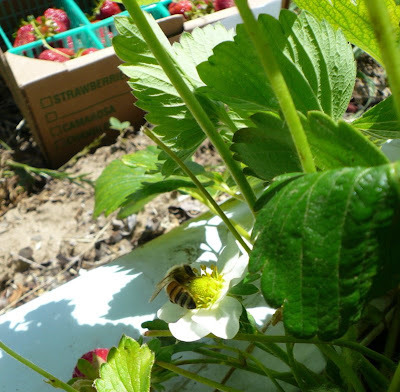 Noticing, of course, that honey bees are among the fruit's pollinators. We got lots of yummy berries. 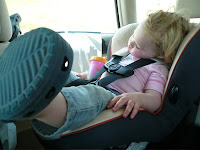 On the way home, E. got the jump on us, nap-wise. We were all grubby with berry juice and happy. It was a berry good day. Jim is the guy I called yesterday to get the playground swarm, since I was busy at work. He sent me some pictures that illustrate the wisdom of delegating. 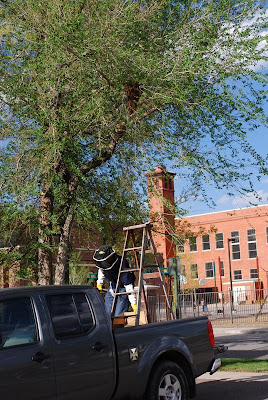 The bees had moved to a tree across the street, about 15 feet up. Jim, his wife and his buddy almost missed it, then had to come up with some means of getting up there. 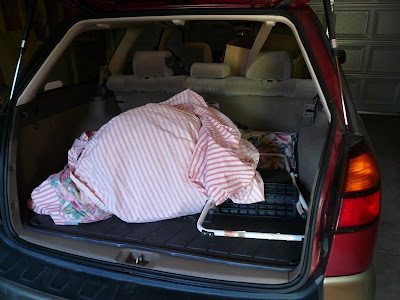 They actually found a woman cleaning out her garage who was getting rid of a ladder! Kids, don't try this at home. 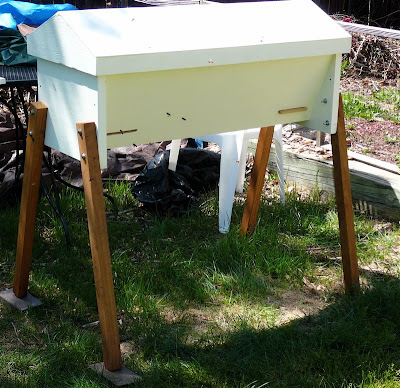 They got the bees down and boxed up without any mishaps, and the bees are now ensconced in Jim's top-bar hive. 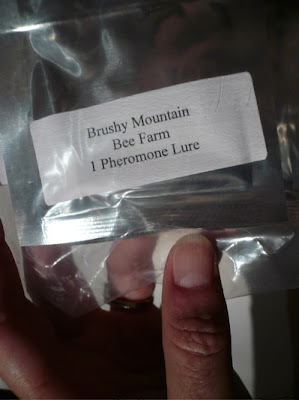 Meanwhile, I ordered a pheromone lure to put in my hive, on the off chance that a passing swarm could just decide to install itself. It's been known to happen! 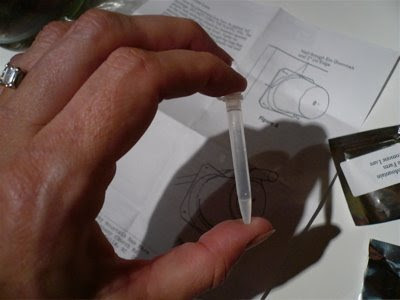 The lure is little vial of liquid that smells amazingly like the lemongrass oil I've already put in the hive. But I'm assured it's different to a bee, and even more attractive. I went out in the dark of night and put it in the hive. Here, it's hung from a nail over the entrance. 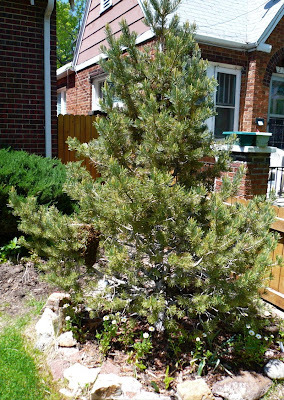 But I changed my mind later and hung it from a string instead, so I can pull it out easily without disturbing the bees. Oy. 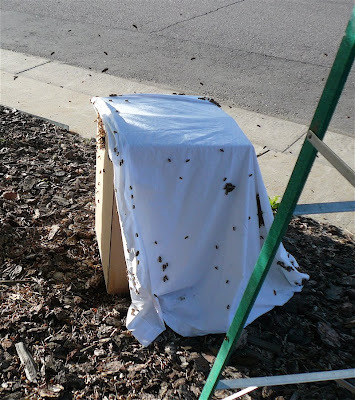 Yesterday a friend's hive swarmed while I was on the phone with her. But we were both on our way to work and had no time to capture them. They were gone by evening. 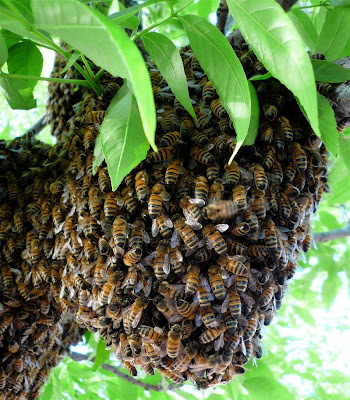 This afternoon I got a call from an elementary school about a swarm on the playground. I considered going after work, in the dark, to try to find them, but common sense won out and I called someone else to go get them. Just as well; the cluster had moved to a tree branch about 20 feet off the ground and it took three people maneuvering with a pickup and ladder to get them. Still at work, late, I got another call: big swarm on the ground at such-and-so address. Could I go at 5 a.m. to scoop them up? Ordinarily I'd say yes, but I've got an early meeting. And my weekend is going to be similarly booked up. The hive is ready to go, and I hung a pheromone lure in it tonight. Maybe the bees will come to me. As I noted in my last post, I stayed up quite late getting the top bars for the beehive waxed. 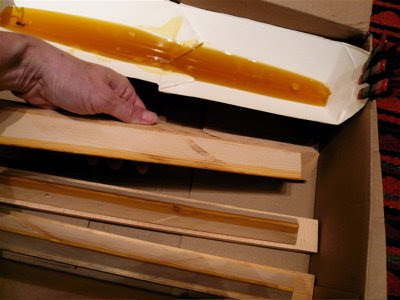 The wax gives the bees extra incentive to build their comb where you want it. In this case, that's right down the center of each bar, which can later be lifted out for inspection or harvest. Rubbing the bars with wax is not as effective as dipping them in melted wax, so I needed to come up with a dipping system that would make the most efficient use of what little wax I have. You saw the shenanigans I went through to get it! A waxed milk carton was the way to go. 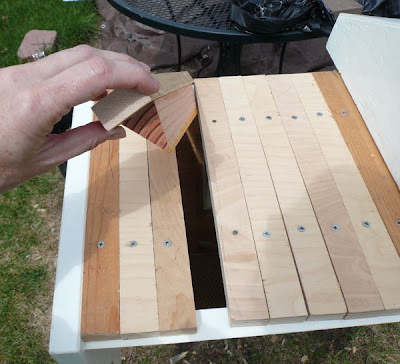 I sliced a quart container down the sides, folded it open and glued the ends and middle, securing everything with clamps to dry. 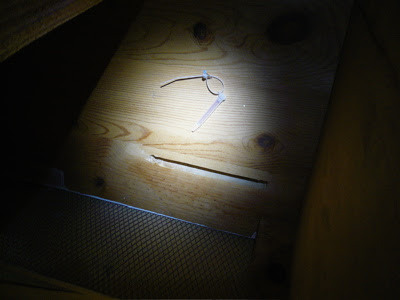 Then I cut the middle flap and glued that back, too, so I had a long trough. 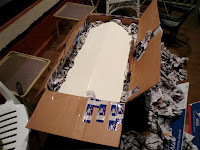 The trough I suspended inside a cardboard box. 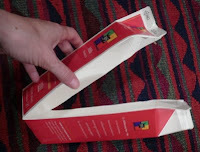 Much easier than trying to cradle it on something, and you have the box to catch drips. 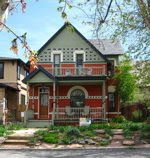 If it's a warm day, you might consider doing this outside, to minimize risk of disaster. 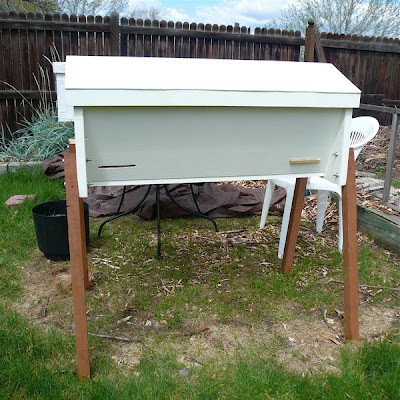 Homing in: Top-bar hive arrives! 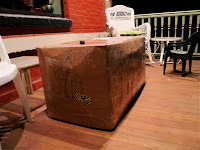 I've been eagerly anticipating the arrival of this Very Large Box. Yesterday was the day! The shipment arrived while I was at work, so I was thankful for good porch lights. There was some very minor assembly involved (attaching the legs), and then .... voilà! 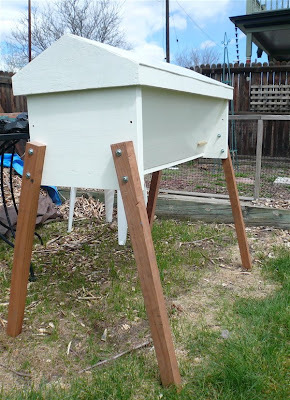 This is a top-bar hive built by the Sergeant entirely from wood he had on hand. 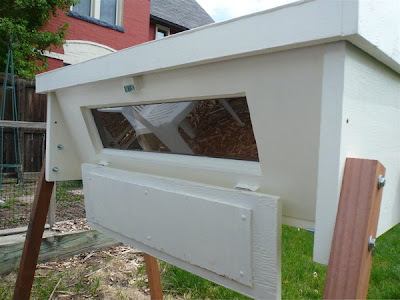 Yep, it's an observation hive! 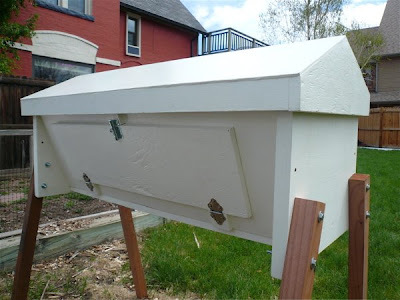 If I want to check on the bees' progress, I don't have to open up the top and disturb them. I can just open the window to peek in. 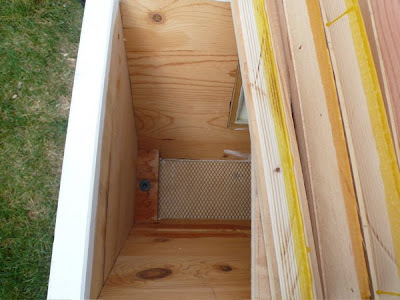 This hive has wedged top bars, which I stayed up late waxing (more on that later). The bees will hang their comb from the bars. And the bottom is screened, with a removable solid board under that. There are also follower boards so I can adjust the volume of the hive as needed. Isn't that awesome? The Sergeant is a genius. Now I just need some bees! 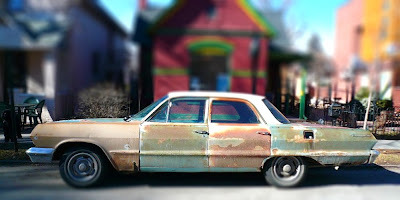 I started hearing about tilt-shift photography not very long ago. It's probably been around for a while. I was impressed by Karen's toy jeep and today found tiltshiftmaker.com (via Cool Tools), where I made my own crude examples from photos of cars in my neighborhood. 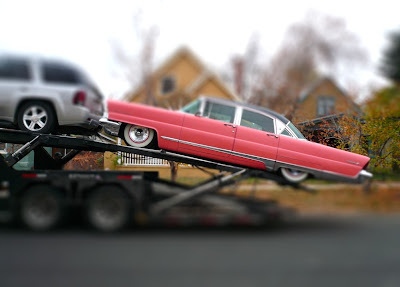 That's a 1956 Lincoln Premiere above and a 1963 Chevy Biscayne below. A very particular kind of photo lends itself to this treatment: preferably taken from above, with lots of foreground and background and small points of interest near the middle. The manipulation of focus is one part of fooling your brain into thinking you're looking at a miniature. The other part is using photos of things that could conceivably be miniatures, such as cars or boats or model railroad scenery. I don't take a lot of such photos, as it turns out, but maybe I'll try snapping a few now with tilt-shift in mind.